Last edited by Crossword; December 11th, 2018 at 04:01 PM. Just caught that at the end of the Skypeia ep, nice. Just wonder if Rox/Rocks has anything to do with it. New One Piece Film: " Unprecedented scale adventure " ! Will Jinbe make it to the movie? 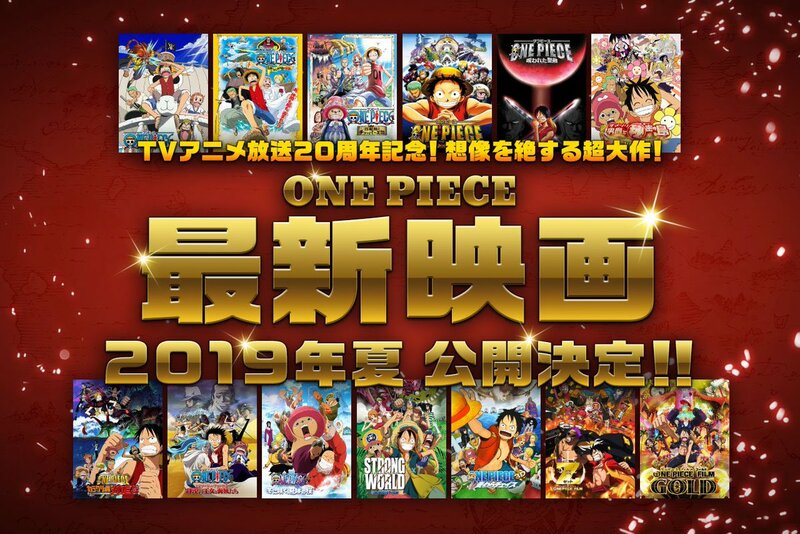 Doubtful, since the movies/merchandise follows the TV anime's lead and he won't be officially, officially joining until sometime during Wano at this rate. Well, now to play the guessing game of whether the character designer/animation director will be Sato for a four-peat or if he'll finally be let free. This is all guessing on my part, but I feel there is enough evidence to support my claim. Sato will be the character designer and chief animation direcror, as he wasn't the chief animation director of the special for a reason. The director's gonna be Otsuka of course, especially since the movie opens in summer which probably means the production of the movie already started a while ago. And who else other than Otsuka is a strong director and has been MIA? So, unless they surprise us with one of the younger directors, I think it's obvious who'll handle the movie. I like Sato's designs, but I wouldn't be bothered if a new character designer took the reigns for this next film. Preferably Koudai Watanabe, but that's probably not going to happen. I just hope that this movie will be good. 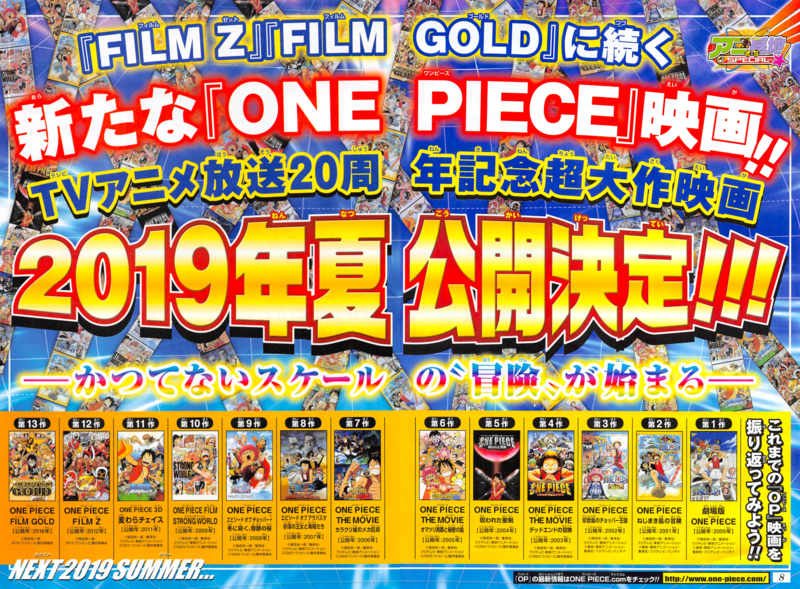 Strong World and Z were good, Gold was half-disappointing in my opinion (Sabo, Lucci and Spandam put there at random). Hope this will be better than the previous one. Yeah, I would rather Sato actually moved over to the anime. His style isn't my absolute favourite, but I think his a stronger character designer than Hisada, and considering that Hisada's been doing loads of key animation for the anime, maybe his stepped down his position for a little while to allow another animator to take the role of character designer? Its complete speculation but its at least interesting to consider. Will be interesting to see what does and doesn't happen. No news in Weekly Shonen Jump, the same information. Summer, so it's still about 9 months minimal from now.I could imagine there's already a trailer after New year. If Toei shares a date I can coordinate going to Japan with when it comes out. I know some might say why spend any time sat in a cinema whilst on holiday but the opportunity to see the latest One Piece film on the largest screen possible with the best sound would not be something I'd want to miss. I also hope the film is decent. The last three have been strong additions and collaborating with Oda only seems to have helped. In any case, let's see what new information we learn at Jump Festa in December. Last edited by Honeyman; November 15th, 2018 at 09:09 AM. maybe those animators are going also to work on new film 2019? what do you think guys , is there any chance to see them in the new film ? Good attention to detail there on the animators. Always cool to hear there's a new One Piece movie in the works, it's a fun oldschool tradition. maybe we have info about new Film..